Welcome to the August 2010 edition of ACE NorCal News! ACE Day at the California State Fair has been an annual event since 2002. The 2002 event was a joint venture with the Monorail Society. A standard feature of each event from the beginning has been complimentary ERT on the fair’s coasters. Through 2008, the midway was operated by Ray Cammack Shows. Butler Amusements, Inc. took over the responsibility for the California State Fair’s midway in 2009. The 2010 ACE Day at the California State Fair was the second time that Butler Amusements has hosted the event for us. We could not be happier that Butler Amusements has chosen to continue our traditional fun day at the California State Fair. A big change for 2010 was that the fair moved its schedule up by about a month. This change was made in an effort to boost attendance by eliminating conflicts with school schedules. As a result, the 2010 ACE Day at the California State Fair was the first ever held in July. Thanks to Butler Amusements, we started off our day at the fair with complimentary admission to the California State Fair. ACE’s good friend Mike Gorman of Butler Amusements started things off by giving everyone some handouts with information about Butler Amusements. Then he surprised us with a drawing for some cool Butler prizes, including a ultra-rare 40th anniversary hard-cover book about Butler Amusements Inc. The winner of that treasured item was Nicholas Laschkewitsch. Next up, Mike Gorman led us on a fascinating behind-the-scenes tour which really gave us an appreciation of how enormous the task is to transport and operate such a large midway. The final stop on the tour was an unexpected treat. The entire group was warmly welcomed into the quarters of Mr. Earl “Butch” Butler, CEO and President of Butler Amusements, Inc. We enjoyed a fascinating conversation with him about the company and the amusement industry. Following the tour, all were ready for some complimentary ERT on the fair’s two coasters: the spinning Pole Position coaster and the Zillerator. At the end of ERT, the group gathered at the new Butler Amusements Magical Midway sign for a photo. Then, armed with a generous supply of free ride passes — courtesy of Mike Gorman and Butler Amusements — most of the attendees spread out to enjoy the rest of the day at the California State Fair. After hearing Mr. Butler’s description of the new LED lighting package on the Giant Wheel, many of the ACEers in attendance chose to stay until after dark. They were not disappointed. Consisting of 57,500 LEDs in 2400 modules, the wheel’s lighting package is nothing short of spectacular, including amazing programmed patterns not seen before. As a further bonus, the new lighting package yields energy savings of 92%! We would like to thank Mike Gorman, Butch Butler, and the rest of the team at Butler Amusements for their kindness and generosity. Special thanks also go to Richard Tuck, Frank Biafore, and Tim Sauer for their help in making the 2010 ACE Day at the California State Fair a success. 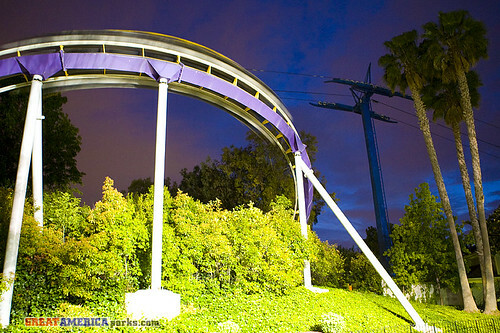 On July 18th, ACE NorCal held an event at Six Flags Discovery Kingdom. Twenty eight people attended ACE Day at Six Flags Discovery Kingdom, including three under the age of two. Our picnic lunch by the lake was delicious and included pulled pork sandwiches in addition to burgers and dogs. During our lunch, the staff brought out a three year old alligator named Ali, a two-toed sloth, and a beaver. We were allowed to touch the alligator and sloth. The trainers answered questions about three animals. Charles Laureano was on hand to answer coaster questions from the audience. His favorite steel coaster is Medusa. While at the California Maritime Academy he was able to travel to some exotic amusement parks in Vietnam and Japan. He also talked about his career path and how he got his job as a Supervisor at Six Flags Discovery Kingdom. Later that day, the park held a raffle. Some of the better prizes were paintings made by the camels, and Discovery Kingdom water bottles. The park also gave all attendees commemorative 10th Anniversary Medusa posters. Six Flags Discovery Kingdom also donated the custom Medusa 10th anniversary banners to ACE to be auctioned off in support of ACE’s preservation and archives funds. The final treat was an hour of ERT on Roar. The Roar crew was a lot of fun. The ERT was phenomenal, with two-train operation. Everyone could stay on board for the entire time if they wanted. Edgar Vidal, Senior Account Executive for Tour and Travel at DK worked very hard to put this event together. Thanks, Edgar! The Lunch with Legends was a fantastic luncheon with the Boardwalk’s Charles Canfield (Park President), Ted Whiting III (Vice President), Carl Arnett (Technical Services/Maintenance), and Carl Henn (Director of Maintenance & Development). The lunch came about at the 2009 ACE Holiday Party hosted by Richard Tuck at Playland-Not-At-The-Beach (PNATB). It was part of the auction that takes place every year at the party. Our friends at the Santa Cruz Beach Boardwalk wanted to come up with a highly-creative auction item for the ACE party and the result was the Lunch with Legends. Among the items at the auction were roller coaster wheels, Medusa brake pads, original boards from the Santa Cruz Beach Boardwalk, and this fantastic lunch opportunity. Frank Biafore of PNATB won this in the auction and seven ACE members in turn went to this lunch on June 25th, 2010. The seven ACE members who attended were: Cody McAllister, Richard Tuck, Frank Biafore, and Nicholas, Brian, Shelly, and Courtney Laschkewitsch. Our delicious lunch took place at the Coasters Bar located inside the Boardwalk Bowl across the street from the Neptune’s Kingdom Arcade. During the lunch, many great stories were told and facts about the park and its vast history. One interesting fact was that 70% of the season passes the Boardwalk sells are from OUT of the county. Pretty surprising, don’t you think? After the lunch, Carl Arnett and Carl Henn went back to their offices, while Charles Canfield and Ted Whiting showed us a little bit behind the scenes in the Cocoanut Grove facility. We got to see very old rooms that have literally been unchanged since they were built. There were old dressing rooms, stairways and other rooms. The kitchen was very modern, big, and smelled great as they were cooking a salmon appetizer for an upcoming event. Before we knew it, the little tour was over as the group was dropped off in the Neptune’s Kingdom. Our group was then let free to roam the Boardwalk, and of course, enjoy the NEW Haunted Castle! After many, many months of construction, Santa Cruz Beach Boardwalk’s NEW Haunted Castle finally had its grand opening on June 4th, 2010. Many people showed up to the grand opening, including members of the Big Kahuna club, and other special invitees. Those who belong to the Beach Boardwalk’s Big Kahuna club were sent this invitation via email to attend the Haunted Castle’s grand opening. NorCal ACE members were also invited to attend. I was very excited to hear that the opening date for the ride was finally set and that I was invited to attend. Many surprises were about to head my way, which I did not expect until I arrived there. My family and I arrived at the Haunted Castle site around 9:00 A.M., when the fog was just beginning to lift. Soon, officials and other attendees began to arrive, which got me even more excited to be able to attend the opening. Brigid Fuller, the park’s publicist whom I already knew, walked up to me and asked, “Nicholas, how would you like to be on the first ride of the Haunted Castle with Charles Canfield (Park President) and Ted Whiting III (Vice President) this morning?” I was completely shocked and amazed. Then she said, “We will also be presenting you with a gift for your dedication towards the NEW Haunted Castle!” Shortly after, the crowd gathered in front of the Haunted Castle to hear Kris Reyes, Charles Canfield, and Ted Whiting III give a talk about the ride. Before any of them spoke about the ride, they talked about me and another boy (whom was a big fan of Sally Corp.) named Tyler and how we were big fans of the park and new ride. As thanks, we were each given an original piece of concept art from the ride signed by the park president himself, Charles Canfield. We were both very pleased to receive such an amazing gift. Neither he nor I expected this! After a few words from Charles, Ted, and Kris, Tyler and I were off to be the first riders on the NEW Haunted Castle. The ride overly exceeded my expectations by 100%. I was completely amazed by how wonderful the ride was done. The Haunted Castle is a ride specifically geared towards families that bring their kids to the Boardwalk and the park brings in a lot of those! I would like to thank Brigid Fuller, Charles Canfield, Ted Whiting III, and Kris Reyes for giving me this amazing opportunity to be one of the first four riders aboard the NEW Haunted Castle. 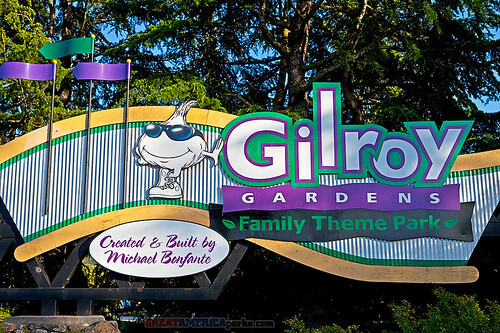 Also, huge thanks to R&R Creative Amusement Designs of Anaheim, CA for the overall design of this great attraction. Thanks to Sally Corp. for the animatronics for the ride, along with every other company involved in this unique attraction. I highly recommend everyone to take a spin, on the Santa Cruz Beach Boardwalk’s NEW Haunted Castle! California’s Great America is featuring a fireworks display every Saturday night in August. The dates are August 7, 14, 21 and 28. On Friday, August 20th Charles Canfield (President), Ted Whiting III (Vice President General Services) and several other executives of the Santa Cruz Seaside Company (fondly known as the Beach Boardwalk) are planning a visit to Playland-Not-at-the-Beach in El Cerrito. And they are not coming empty-handed! Last month Richard Tuck, Frank Biafore and four other ACE members attended a special “Lunch with the Legends” event at Santa Cruz which had been the grand prize at the ACE Yuletide Party last December. In addition to the lunch at the Boardwalk Bowl, the group was treated to a tour behind the scenes of the Cocoanut Grove personally led by Charles Canfield. The new Haunted Castle attraction had just recently opened, and the group got to hear the stories of what was involved with tearing open the boardwalk itself to build the 10,000 square foot ride underneath it. During the lunch the executives from the Santa Cruz Seaside Company also got to hear about Playland-Not-at-the-Beach (PNATB) and expressed interest in a visit to see the attractions. PNATB already showcases Fascination tables that were donated from Santa Cruz last year. The El Cerrito Museum of Fun also plans to unveil a “Rollercoaster Rampage” attraction later this year; it will feature a car from the Giant Dipper (thanks to ACE members Nancy Redden and Mike Chew). Charles Canfield gave PNATB a generous supply of the 100th anniversary DVD history of the Boardwalk. Playland gave each of the legends a copy of the new “Remembering Playland” DVD. Now, on August 20th the Lunch with the Legends group is convening at Playland-Not-at-the-Beach, and ACE members are invited to help out. “We want to return their hospitality,” Richard Tuck explains, “We will provide lunch and treats. Any ACE members who are available that Friday and would like to meet the executive team from Santa Cruz, just give me a call.” [Please call Richard at the number included in your email from ACE NorCal.] Charles Canfield and company are bringing a large truck with them to deliver a special gift to Playland-Not-at-the-Beach. Playland’s annual Super Heroes Weekend is almost here! Wear a super heroes costume and win an instant prize. Play our Super Heroes and Super Villains Treasure Hunt. We’re entirely indoors so you can avoid the heat and cool breezes. Superman, Batman, Wonder Woman, Poison Ivy, Green Lantern, Iron Man — you’re all welcome to compete! Don’t miss the fun for all ages! Prizes for everyone! Ever want to learn how to become a magician? Or just learn some terrific ways to amaze your friends? Or do you have a child or friend who is fascinated with magic and would adore the opportunity to know more? Due to the success and popularity of our first program, Playland-Not-at-the-Beach is very proud to announce a second Summer Magic Workshop from August 9th through the 13th. From 9 AM to 1 PM each day, popular magician, performer and grade-school teacher Mike Della Penna will instruct students on how to perform and enjoy the art of magic. The cost for the full week is just $220, and each student receives a special book and all necessary equipment and props to make his or her show a success. The course will consist of five days of instruction, practice, coaching and performance development as well as live magic shows by guest magicians and historic footage of some of the world’s most famous magic acts. This is a wonderful way to develop self-confidence and enjoy a great summer activity. Magic Camp is open to students of all ages from 7 to 107 years old. This will sell out quickly, so call (510) 232-4264 ext. 24 to reserve a space. Learn Laughing Sal’s history and meet her family. Listen to the fascinating stories of what it was like to run the Fun House at Whitney’s Playland. Unlock the mysteries of where Sal originated. Find out about her choice of dresses, and who recorded that famous laugh that everyone loves or hates. At Playland-Not-at-the-Beach you will have the chance to meet not just Laughing Sal but also Sinister Sal! Bring your cameras!Come dressed as Sal and win prizes! This weekend we will be honoring the masterpieces of animation being produced by Pixar Studios. See how many characters and stories you and your children can identify. Come dressed as a Pixar character and win prizes as you enter. On display will be some of the most famous scenes from Pixar classics. Tentatively we hope to have some artists describing the art of Pixar animation. Playland is bringing back one of our most popular weekends from last year. Ahoy, Matey! Come dressed as your favorite pirate lad or lass and face our “Walk the Plank” challenge! There will be treasure hunts, mounds of gold, but watch out for that gold-toothed villain — Black Bart. He might try to steal your rewards when you are not looking. Great fun for all ages and all indoors! 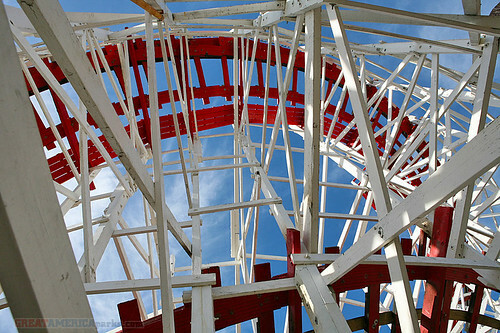 September 4, 1972 was the final day of operation for Whitney’s Playland at the Beach out at Ocean Beach. But Playland will live on forever in our hearts and in our Playland-Not-at-the-Beach Museum of Fun, as you will discover this 3-day weekend. We will be conducting behind the scenes tours showing how we built his museum, we will also be recruiting volunteers to carry on the tradition, and there will be special treats and contests for everyone. Bring the kids and the grandkids too. We’re all indoors so the heat won’t matter. Come have a grand time! Put on your helmet and pull out your bullwhip. Become Indy Jones or Dora the Explorer as you try to solve our mysteries. We supply the treasure maps, the compasses, and all the tools to discover the hidden treasures. Beware the Chamber of Laughter and don’t get fooled by the Foolish Fortune Teller. She’s just trying to get you lost! These adventures are geared for every age from 5 to 105. Playland Celebrates the IT’S-IT ICE CREAM BAR!! Whitney’s Playland at the Beach introduced the IT’S-IT ice cream bar, one of the world’s foremost taste treats and rumored to be our webmaster’s favorite ice cream bar. This weekend the treat is for you! Come by and hear the origins of the incredible treat, and have a FREE It’s-It Ice Cream Bar this Weekend ONLY! As you enter the Museum of Fun you will receive the egg of a Dragon. You must find the clues to the Dragon’s Nest before the egg starts to hatch. Surprises and laughs as everyone tries to find the correct nest for the eggs. Join us for a truly unique way to have fun! A brand new adventure, and you will find this only at Playland-Not-at-the-Beach! Playland-Not-at-the-Beach nonprofit Museum of Fun, open to the public every Sat, Sun and school holiday. Open evenings for private events 365 days a year. 10979 San Pablo Avenue, El Cerrito, CA 94530 (510) 592-3002. http://www.playland-not-at-the-beach.org . Admission $10 for kids (to 13), $10 for seniors (55 and up), and $15 for general admission. Admission includes 34 free pinball machines, penny arcades, carnival games, treasure hunts, miniature dioramas, and surprises around every corner. ACE members receive a $5.00 discount on admission upon presentation of their ACE membership cards. — Thanks go to Richard Tuck and Frank Biafore for contributing to this article. Weeknight Discount Events continue in August, Mondays through Thursdays after 5:00 PM. Mondays and Tuesdays are 1907 Nights with special old-time pricing with rides at $1.00 each as well as $1.00 each for hot dogs, cotton candy, and Pepsi-brand soft drinks. Wednesdays and Thursdays are Pepsi Nights, on which an empty Pepsi can will entitle you to purchase an unlimited rides wrist band for $9.95 plus tax. Last call for summer at Six Flags Discovery Kingdom! Our good friend Edgar Vidal at Six Flags Discovery Kingdom invites all ACE members, their family, and their friends to come on out to the park from August 9th through 22nd at a special price! Just go to http://www.sixflags.com/discoveryKingdom/ and enter the promo code sky8 as instructed in the image above. Have a season pass? Use this offer to bring your friends and family. You’re welcome to pass this deal along to all your friends and family. Six Flags Discovery Kingdom is open daily in August through the 22nd. It is also open on August 28th and 29th. See the links below for more info.